Creative Resort Representation Company, World Resorts of Distinction (WRD), is proud to announce that one of its boutique resorts in Fiji – Toberua Island Resort – has been awarded a distinguished PADI Green Star Dive Centre Award. Toberua Island Resort is a unique, privately-owned island set on four sandy acres of lush, tropical gardens located in the middle of a private azure lagoon off the east coast of Fiji’s main island, Viti Levi. The PADI Green Star Dive Centre Award is granted to PADI dive centres and resorts that demonstrate a dedication to conservation across a wide range of business functions, including water conservation, energy use, environmentally-friendly transportation practices, use of sustainable materials, conservation leadership and support of Project AWARE. 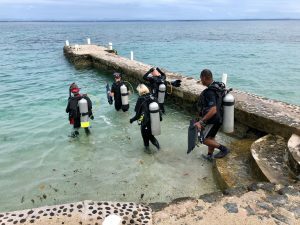 WRD Resort Marketing Manager, Narelle Langton, said the award identifies dive businesses that care about the environment and are acting to protect it. “Toberua Island Resort’s fully equipped PADI dive centre, Toberua Divers, takes its commitment to ocean conservation and general environmentalism very seriously, so to be recognised with the PADI Green Star Award is a huge achievement for the entire team,” she said. Dr. Ingram is an experienced educator, seasoned world traveler and advocate for the underwater world who joined the Toberua family recently with a wealth of cultural and diving knowledge. He started diving in 1993 and crossed into the professional realm in 2005. He has received several accolades from PADI and reached the highest rating of PADI Course Director. He has also been recognised as a “Silver” Course Director for professional development, after training over 300 students last year. One of the first projects Dr. Ingram was involved with at Toberua Island Resort was adopting a dive site and registering it with Project AWARE.